Siccar Point is a short walk from the nearest road, and it is signposted as part of the Berwickshire Coastal Path, which runs from Cockburnspath to Berwick upon Tweed. One of the best approaches is along the coastal path from Cove to the north – this is a 6 km walk on grassy paths and takes about two hours (one way). It gives a great introduction to the geology of this area as you follow Hutton’s route from the north, and “walk back in time” from the youngest rocks of the area to the oldest. If you are happy with a bit of a walk (12 km round trip), you can get to Siccar Point by public bus from Edinburgh or Dunbar – makes a great day out! Borders buses service 253 runs between Edinburgh and Berwick upon Tweed, stopping at Cockburnspath. Safety note: Siccar Point itself is at the foot of a steep grassy slope, which can be treacherous. The key features can be observed from the top of the slope. The waymarked Coastal Path (and part of the Southern Upland Way) is a level, easy path along the clifftop, with great views of Carboniferous sedimentary rocks and the Old Red Sandstone exposed on the shore. The path meets a minor road and descends to the entrance to the Pease Bay Caravan Site. From there, across a ford, the road climbs steeply, and a set of steps to the left of the road takes you back to the cliff top for a short distance before you join the minor road which leads to Drysdales vegetable processing site, located in the Old Cambus Quarry. Follow this road to a parking area on the left about 100m before the entrance to the Drysdales site. An interpretation board beside the gate gives further information about Siccar Point. Go through the gate and walk along the left (seaward) edge of the field, past St Helen’s Chapel and along the fence (follow the Outdoor Access Code). At the far corner of the second field you’ll find a kissing gate and another interpretation board. Go through the gate, and about 50 m beyond this you get to the cliff top with Siccar Point spread out before you. From the A1 south of Cockburnspath, take the A1107 towards Coldingham. After 1 km, this goes over a narrow (single track) stone bridge over Pease Dean. 400 m past the bridge, turn left (signposted Pease Bay). After another 400 m,ignore the second sign for Pease Bay and keep straight on (past the sign for the Drysdales vegetable processing site). The narrow road winds through a shallow valley. Look out for the parking area on the left, about 100 m before the entrance to the Drysdales site. 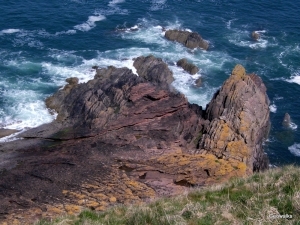 I often accompany groups to Siccar Point, and it is usually in my annual Guided Walks Programme. Please get in touch for more details. Shop, toilets and in the village of Cockburnspath. Shop, toilets and pub at Pease Bay caravan site. Get in touch if you would like advice about visiting Siccar Point, or to book a guided visit with geologist Angus Miller.